Ladies and gentlemen, you see before you the complete works of Charles Dickens in 30 volumes. I have committed all these books to memory, page by page, word for word. Impossible? Well it took me 8 months to memorise it all! Allow me to demonstrate. My assistant here from the audience will randomly choose a book volume and then the page number. Next, we shall use dice to select the line number and the word. Now, please give me a moment to focus. I shall close my eyes as it helps me to visualise the thousands of pages I have memorised. So we have volume 3…page 154…yes, I can see it…a chapter of Bleak House, am I correct? [Murmurs of excitement emanate from the audience as the assistant confirms this]. And now the line number 18 [the performer moves his finger in the air as if moving it down the page of a book]. Yes…and the sixth word as chosen by the dice [the performer now moves his finger very slowly, as if feeling the words in an imaginary sentence]. The word…is…persuasion! [The assistant confirms this and the audience cheers with amazement]. Mentalism is a remarkable performance art. Its practitioners demonstrate abilities that include telepathy, clairvoyance, divination, precognition, psychokinesis, mediumship, mind control, memory feats, rapid mathematics, and hypnosis. Yet these people are not psychics or mathematical geniuses, they can’t predict the future or speak to dead people. So how do they demonstrate these abilities so convincingly, leaving the audience mind boggled as to how they have achieved this? Therein lies the skill and training of the mentalist, and Derren Brown is perhaps the best known of his ilk in this country. You’ve seen him on television; you may have seen him on stage. I once saw him in the bathroom department at Selfridges and gave him a wide berth in case he hypnotised me into buying him a set of Missoni towels. Derren, like all the great stage performers, is obsessed with his art, and he’s honed it into a finely tuned vehicle of trickery and showmanship. Mentalists do require sharp cerebral abilities, such as being able to perform mathematical calculations quickly, or remembering large amounts of information, but this is nothing the average man can’t do if he puts enough time and effort into it; and Derren puts in a lot of time and a lot of effort. Would you like to be able to calculate the square root of any number in a matter of seconds? Or perhaps memorise a long list of items in the time it takes you to read them, and then be able to instantly recall any of those items, stating the order they were listed? This latter trick I have learned myself and I am always amazed how easy it is when you know the method. Mentalists combine other skills such as cold reading, which takes many years of practice, and the aforementioned mathematical talents, with more standard stage tricks to continually deceive the audience. One is never quite sure how much of the act is a genuine mental skill or an elaborate magic trick, and that’s part of the joy. In 1968, renowned mentalist Tony Corinda published a booked called 13 Steps to Mentalism. It’s one of the most fascinating and eye-opening books I’ve ever read. Something of a bible for mentalists, it describes in detail many common tricks of the trade, including the amazing memory test, the book test as described at the beginning of this article, seemingly impossible mathematical calculations, mediumship and a host of other quite implausible acts and feats of the mind. I have always been fascinated by magic and mentalism and this book only heightened my interest in the subject. 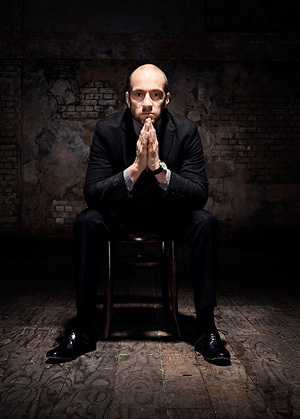 Far from ruining the spectacle of seeing someone like Derren Brown perform, I was able to appreciate just how skilled he is, how much time, thought and energy he puts into his acts, and how clever – and bold – they are. 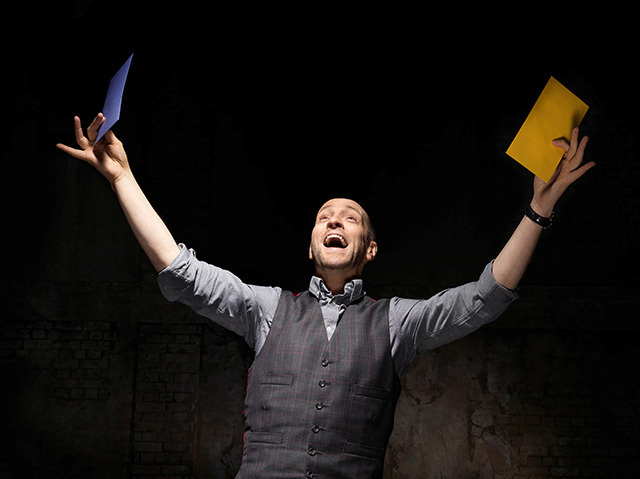 Currently on stage at the Palace Theatre, Derren is delighting audiences once more with his latest show, Infamous. We have been asked not to reveal exact details about the performance, but suffice to say you will see the full spectrum of mentalist classics with Derren’s characteristic patter. It was a joy to behold; watching someone at the top of their game is always thrilling and anyone who enjoys magic or mentalism should certainly get themselves a ticket to his show as soon as they can. Pay close attention to everything he does, and afterwards lie awake in bed all night wondering how he did it. In most cases you will believe that he really is capable of memorising the entire works of Dickens, or is able to influence members of the audience to make ‘free’ decisions which he has predetermined. If you are still sceptical but you can’t work it out, which I dare say you won’t, consult the Corinda bible and you will get an insight into the skill of the cerebral stage performer. You might even learn a trick or two yourself. 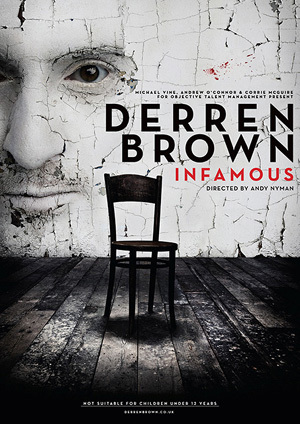 Derren Brown: Infamous is at the Palace Theatre London until 17th August 2013, and will then be touring nationwide in 2014. For more information, tickets and dates, visit the website.